Via Nick Diakopoulos, I see that Google News has added badges, awarded for reading an number of articles on a certain topics. You earn them privately and can then share them. Nick has some thoughts on his blog. I agree with a lot of Nick’s thoughts. Having validated reading behavior is useful – though it’s also interesting to get the difference between what topics people read and what topics people want others to know they read. As Nick points out, it might be a way for people to communicate to others that they are an expert on a topic – or at least an informed reader, as I suspect that experts may have other channels for following the topics about which they care most. Though BunchBall sort of looks down on the quantified self aspect, I do think it’s useful to give people feedback on what they are reading (sort of like last.fm) for news topics rather than what they think they read, though badges probably aren’t quite as data-rich as I’d want. At Michigan, we’re trying a similar experiment as part of the BALANCE project shortly, to assess whether feedback on past reading behavior affects the balance of political articles that subjects read. If people do care about earning the badges, either to learn about their reading behavior or to share with others as a sign of their expertise or interests, then they’ll probably read more of their news through Google news – so that it is tracked in more detail. Thus, a win for Google, who gets the pageviews and data. 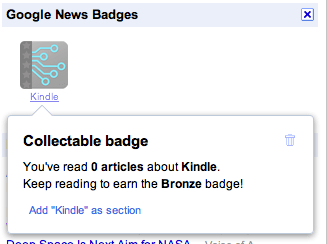 Google, why do you want me to earn a Kindle badge? Influence When I first visited, I was encouraged to earn a Kindle badge. I couldn’t figure this out. Yeah, it’s an interesting product, but I don’t want to read a lot of news about it and a review of my Google News history showed that I never had through the site. So why, of all the >500 badges that Google could suggest to me (many for topics I read lots about), is it suggesting Kindle and only Kindle? If left me wondering if it was a random recommendation, if whatever Google used to suggest a badge was not very good for me, or it was a sponsored badge intended to get me to read more about Kindles (speaking of potential wins for Google…). Whatever the case, this highlights a way that badges could push reading behavior – assuming that people want to earn, or want to avoid earning, badges. This can run both ways. Maybe someone is motivated by gadget badges and so reads more about Kindles; maybe someone doesn’t think of themselves as interested in celebrities or media and is thus pushed to read fewer articles about those topics than they were before. I’m not saying this is bad, per se, as feedback is an important part of self-regulation, but if badges matter to people, the simple design choice of which badges to offer (and promote) will be influential, just as the selection and presentation of articles are. Tags: badges, gamification, google news, news. Follow any responses to this post with its comments RSS feed. « Sunlight Labs’ Inbox Influence: Sunlight or Sunburn?